^ DCC Doppelmayr Cable Car (2008). Company Presentation: Fully Automated Cable-Propelled APM Systems. DCC Doppelmayr Cable Car GmbH. p. 13. ^ DCC Doppelmayr Cable Car (2008). Automated People Mover (APM): Planner's guide. DCC Doppelmayr Cable Car GmbH. p. 39. ^ a b DCC Doppelmayr Cable Car (2008). Automated People Mover (APM): Planner's guide. DCC Doppelmayr Cable Car GmbH. p. 35. ^ DCC Doppelmayr Cable Car (2008). References. DCC Doppelmayr Cable Car GmbH. p. 8. ^ DCC Doppelmayr Cable Car (2008). 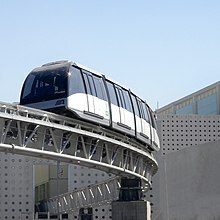 Automated People Mover (APM): Planner's Guide. DCC Doppelmayr Cable Car GmbH. pp. 45.